Aka the game where it all went wrong. So I’m back at it again, this time recapping Birth by Sleep, which is technically the first game in the timeline and the fifth to be released chronologically, waaaay back in 2010 for the PSP, and is forever infamous for the trailers spoiling absolutely everything and the fanbase guessing the entire plot, barring Aqua’s fate. But, if you’re a newbie, here’s the rundown: set ten years before the first Kingdom Hearts, the game is split into three scenarios, each with their own playable characters, Terra, Aqua, or Ven, They all follow the same timeline and visit the same worlds, but not necessarily in the same order, or at the same time. So, without further ado, let’s get on with it. This is where the series got complicated. 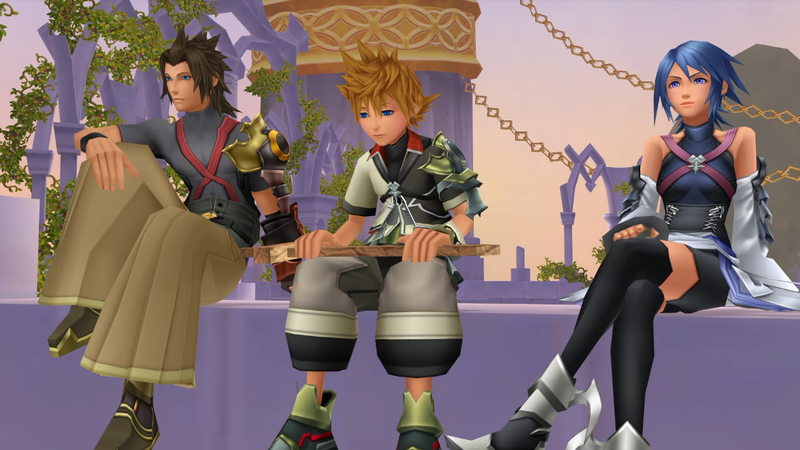 Terra, Aqua, and Ven all live in the Land of Departure, training as Keyblade wielders under their master, Eraqus. To officially become a Master, you need to pass the Mark of Mastery exam, supervised by Eraqus and his old friend, Master Xehanort (what this exam exactly entails is unclear), and Terra and Aqua do this by… fighting balls of light and sparring? Anyway, Terra fails this test, because his darkness flares up briefly during the spar with Aqua, and, influenced by Master Xehanort’s decision, only allows Aqua to pass. Terra, apparently, doesn’t have enough control over his darkness, and Eraqus is firmly of the belief that all darkness = bad. 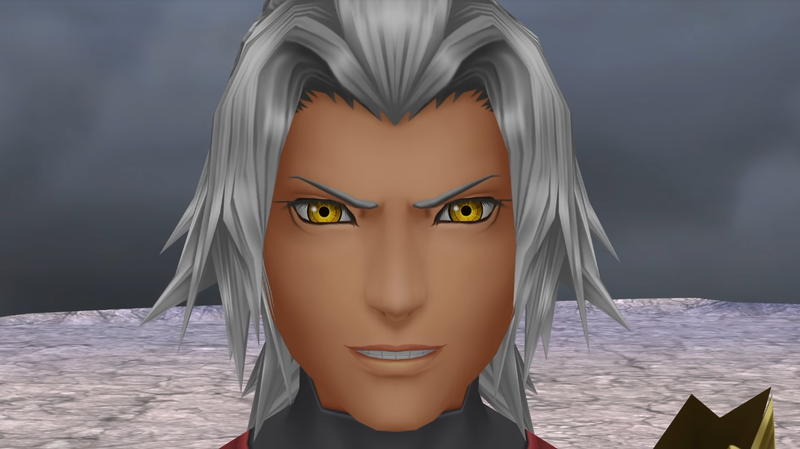 Terra’s naturally quite upset about all this, and Master Xehanort is oddly flippant; embrace the darkness, because it’ll make you strong and worthy of being a master. But before Terra can really ponder this, there’s more important things going on. Eraqus is alerted to the fact that odd creatures called the Unversed are terrorising the worlds, and someone needs to go and sort this out. Oh, and Master Xehanort’s just up and vanished. Fantastic. Eraqus sends Terra out to investigate the Unversed and find the missing Master, with Eraqus pointing out that if he does well, he may be able to change Eraqus’ mind and become a Master after all. Ven, on the other hand, isn’t supposed to be doing anything – until a strange boy in a mask baits him into following Terra, saying that Ven’s being left behind and Terra won’t be recognisable when they finally catch up. Poor Aqua, meanwhile, is sent to wrangle Ven back home, and keep an eye on Terra to make sure he doesn’t succumb to the darkness. Image sourced from the KH wiki. The three all visit various Disney worlds, which due to an inherent flaw with the game’s writing, aren’t all that relevant to the plot since they really only follow the story of their various movies. Special mention does go to Enchanted Dominion, though, where Terra encounters Maleficent, who manipulates him into accidentally removing Princess Aurora’s heart and inadvertently aiding her in the search for the seven Princesses of Heart. This is the first crack in Terra, Aqua, and Ven’s relationship, though this time, both are adamant that Terra would never do that, and it’s all a big misunderstanding. After Terra visits a few more Disney worlds and is tricked by a few more villains, he eventually tracks down Master Xehanort in the Keyblade Graveyard, and he explains the origin of the Unversed. The masked boy that I mentioned Ven encountered earlier? Yeah, his name is Vanitas, and his negative emotions take physical form and spawn the Unversed, seeking to destroy the light. Oh, and he’s quite literally the dark half of Ven, half of his heart ripped from his body, in a “training accident,” when he was Master Xehanort’s apprentice. He was then left with Eraqus as a pupil, and managed to recover (thanks to, as shown in a flashback, linking his heart with a newborn Sora’s when Master Xehanort dumped him on Destiny Islands to die), but has no memories of any of that. So, where would this light destroying monster seek to go next? Radiant Garden, of course, the city of light. 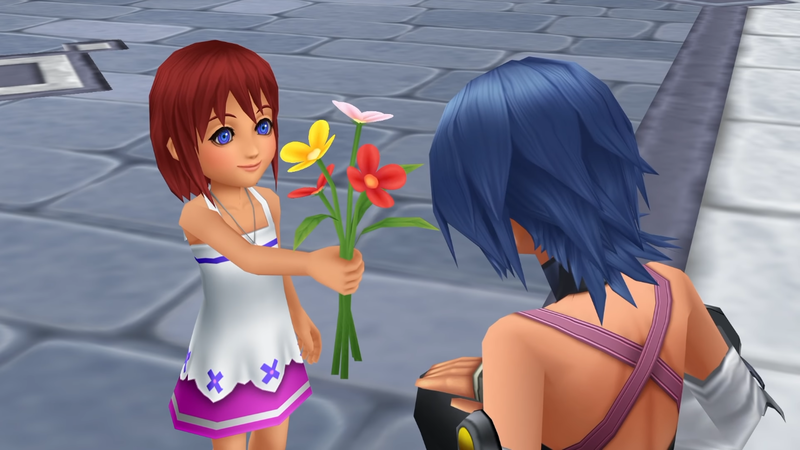 Aqua also arrives here, meeting a young Kairi in the process and accidentally bequeaths her keyblade to her while protecting her from the Unversed, as well as putting the protective charm on her necklace that would eventually send her to Destiny Islands when Radiant Garden falls to darkness. She then meets up with Terra and Ven, but the mood is tense – Aqua’s heard what he’s done in other worlds, and she’s not happy, Ven still being his unflinching supporter. Terra finally cottons on that Aqua was sent to spy on him, and storms off, Ven running off again after him. Before Ven leaves the world, there’s a brief scene where he meets Lea and Isa, the Others of Axel and Saix, where it’s foreshadowed that they’re trying to sneak into the castle, where Ansem and co are doing all their experiments. After Terra storms off, he runs into Braig, aka Xigbar’s Other, who claims to have kidnapped Master Xehanort. He manages to fight Braig, but taps into the darkness to do it, leaving the man with a few nasty scars and minus one eye, and Terra with a ton of guilt he used the darkness again, but Master Xehanort reassures him that he did the right thing. Eraqus was far too blinded by the light and would never have made Terra Master, so he offers instead to take Terra as his pupil. A few Disney worlds later, Terra ends up on Destiny Islands, sees a young Sora and Riku, and decides to perform the Keyblade Inheritance ceremony on Riku. Aqua isn’t far behind, and sees that as Terra has done the ceremony, she won’t do the same for Sora. Before Terra can catch up with Ven, though, Master Xehanort warns him that he’s going to confront Eraqus about his past. Though it was revealed early on that Ven doesn’t remember anything, Master Xehanort spilled the beans to him – that “training accident,” was a deliberate split, designed to have a heart of pure light and pure darkness clash to form a mystical weapon that the original Keyblade War was fought over – the X-blade. This is also the reason Eraqus was so hell bent on stopping Ven chasing Terra into the outside worlds, in case the weapon ended up being forged, and Ven’s encountered his dark half, Vanitas, and fought him several times, since he left home. In the midst of this conversation, Terra arrives, only to see Eraqus threatening to kill Ven., and sends him through a portal to safety. They clash, and things look like they’re going to calm down, until Master Xehanort arrives, kills Eraqus, and promptly destroys the Land of Departure. Things just go from bad to worse. The trio eventually find each other at the Keyblade Graveyard, Terra escaping the crumbling Land of Departure, Ven heading there from Destiny Islands, where Terra’s portal sent him, where he encounters Vanitas again, who threatened to kill Terra and Aqua if he didn’t go. Master Xehanort meets them there with Vanitas, and finally reveals his grand plan – to create another X-blade, get to Kingdom Hearts, and watch as another Keyblade War rages, as the one mentioned back in Chi and Union Cross happened a long, long time ago. The trouble is, he’s really too old to be doing all of that, so he needs a shiny new body to do it – and he’s got his eyes set on Terra’s; since he’s been goading him to give in to the darkness for so long, it’s perfect for his needs. Needless to say, there’s a huge fight, forcing Terra to use the darkness again, which lets Master Xehanort transfer his own heart into Terra’s body and take it for himself. Terra’s mind, on the other hand, lives on somehow in his suit of armor, creating the Lingering Will, in which he beats who is now known in the fandom as Terranort, to a bloody pulp. Ven, on the other hand, has fought and merged with Vanitas (unofficially known as Venitas), and actually forged the X-blade, whom Aqua ends up fighting, while Ven battles for control of his body back. Aqua manages to break the X-blade, and Ven fights off Vanitas, but the damage to his own heart is grave. After Aqua finds him, she finds out that Ven is in a deep coma, and won’t wake up until his heart has healed, so to keep him safe, she transforms the broken Land of Departure into Castle Oblivion, stashing Ven in the Chamber of Waking, where he’ll be safe until he recovers. Now to find Terra. And that’s the hard part. She tracks him to Radiant Garden, to find him alive, but has lost some of his memories. Terranort tries to unlock his heart, completely losing his memories in the process, and Aqua just manages to defeat him. She saves his body from falling into darkness, sending her keyblade glider and her armor back through a portal with Terranort, letting herself fall into the Realm of Darkness instead. Terranort is then found by Ansem the Wise in Radiant Garden, and is taken in by him as an apprentice, while Ven’s absent, damaged heart finds its way back to Sora, resting within his for a while until it’s fully healed. Pretty grim, right? Birth by Sleep is the origin story, and one of the series’ biggest tragic tales. Next up, we’re covering 0.2, so more Aqua, this time with HD screenshots!